Representative image of spleen (left) and tumor (right) from anti-CTLA-4 treated mice. Arrows indicate examples of PD-1hi TFH-like cells. Immunotherapy with checkpoint blockade has revolutionized cancer treatment in the last decade. With the initial FDA approval of CTLA-4 blockade with ipilimumab in 2011 followed by the first FDA approval of PD-1 blockade with pembrolizumab in 2014, these drugs have been incorporated into the standard treatment armamentarium of many different types of cancer. These antibody therapeutics, which release the CTLA-4 and PD-1 molecular brakes on immune cells so that they can more potently respond to cancer, have shown long-lasting clinical efficacy. However, this happens only in a limited fraction of patients. The scientific community of tumor immunologists is now intensively investigating the factors that prevent cancer patients from responding to immunotherapy with checkpoint blockade. One of these factors is that tumors protect themselves by attracting immunosuppressive cells that tamp down the immune response. Typical immunosuppressive CD4+ T cells, called regulatory T cells (Tregs), are distinguished by the marker Foxp3. An additional hallmark of these cells is a high expression of CTLA-4. Consequently, immunotherapy with CTLA-4 blockade has the advantage of removing the brakes on effector T cells and potentially inhibiting Tregs so that effector T cells are more efficient at killing the tumor target. 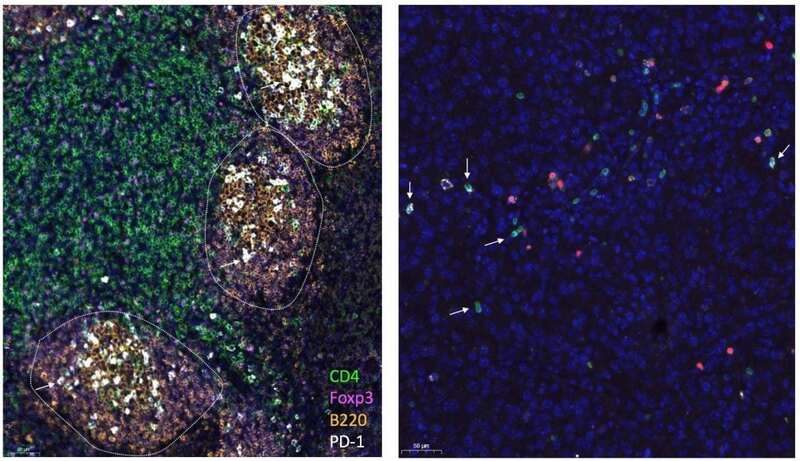 In a recent paper published in Cancer Cell entitled “Non-conventional Inhibitory CD4(+)Foxp3(-)PD-1(hi) T Cells as a Biomarker of Immune Checkpoint Blockade Activity,” a team of immunologists at Memorial Sloan Kettering has shown that, in addition to its previously described function, CTLA-4 blockade can expand a new subset of immunosuppressive CD4+ T cells that express high levels of PD-1 and, in contrast to classical Tregs, lack the canonical immunosuppressive marker Foxp3. Interestingly, they found that, while CTLA-4 blockade increases this cell population, PD-1 blockade is able to reduce and inhibit these cells. The new findings provide an explanation for the incremental anti-tumor activity of CTLA-4 and PD-1 blockade treatments when given together. In addition, this study provides a new cellular biomarker that can be easily monitored in the blood to optimize checkpoint blockade treatment. Refining immunotherapy regimens and schedules so that these cells are kept in the right balance in a personalized way may favor clinical response. Having the possibility to design more personalized treatments would facilitate clinical activity and also reduce the side effects of immunotherapy. The authors tested their hypothesis in animal models of melanoma and breast cancer and corroborated their findings in patients with advanced melanoma and lung cancer treated with checkpoint blockade. The scientists were able to isolate the atypical immunosuppressive T cells from murine and human tumors and peripheral blood and show that they can inhibit the function of effector T cells to become activated and kill tumor cells. The key finding was that the atypical suppressive subset resembles a category of immune cells called follicular helper T cells (TFH), which normally reside in secondary lymphoid organs, such as spleen and lymph node, to control antibody production. The authors thus took advantage of animal models where TFH cells cannot normally develop due to specific genetic defects and demonstrated that checkpoint blockade works better in the absence of TFH, thus confirming their hypothesis. Moreover, the authors found that if the suppressive TFH-like cells were not efficiently down-regulated by PD-1 blockade during treatment, patients had a significantly shorter survival. This confirms the relevance of this TFH-like cell subset in the response to checkpoint blockade in humans. The scientists are conducting further research to integrate this biomarker among others with the aim to increase the prognostic accuracy of predictors of checkpoint blockade effectiveness. In addition, they are working to find means to counteract this unique cell population as a new immunotherapeutic strategy. These findings are described in the article entitled Non-conventional Inhibitory CD4+Foxp3−PD-1hi T Cells as a Biomarker of Immune Checkpoint Blockade Activity, recently published in the journal Cancer Cell. This work is the result of an intense collaboration between clinicians and scientists at MSKCC and the University of Pennsylvania. Dr. Jedd Wolchok and Taha Merghoub from the Sloan Kettering Institute are the lead authors, and Roberta Zappasodi, a Parker Institute for Cancer Immunotherapy Research Scholar in the Wolchok/Merghoub group, is the study’s first author. The study was supported by the Parker Institute for Cancer Immunotherapy and by funding from the NIH/NCI Cancer Center, Swim Across America and the Ludwig Institute for Cancer Research. I am investigating how co-stimulation, with agonist anti-GITR, and checkpoint blockade, with antagonist anti-CTLA4 monoclonal antibodies affect suppressive T cells in tumor microenvironment. In particular, I am involved in the study of the mechanisms of action responsible for the success or failure of these antibodies in preclinical mouse models. In addition, I am also investigating the induction of immune responses to self-antigens using a vaccine based on Alphavirus-like replicon particles (VRP) alone or in combination with immune modulation.